It’s a new age for synths: now that we’ve all got great sounds in our computer, many people want keyboards that give them additional software control. But it’s just as nice to add some built-in sound capabilities, for two reasons: one, added value; two, something fun we can play with while we’re waiting for our computer to start up. Novation’s X-Station delivered both, with a great built-in hardware synth and one of the best keyboard controllers for software on the market, all in one unit. Synth: Details forthcoming, but I like what I see reading the controls right off the image I’ve got: easily-accessible amplitude envelope knobs, modulation envelopes, filters with a dedicated resonance knob and 12/24db switch, LFOs … and everything is right on the front panel. This thing looks like it’ll be a joy to program right from the keyboard; Novation has really done a nice job of putting a lot of synth control on just a few well-thought-out knobs. Now, the best bits. First, there’s a new 32-step step sequencer inside the synth, called the X-Gator. Since it syncs to MIDI clock, you can easily trigger tempo-locked sequences from Ableton Live or whatever software you’re using. That’s on top of a built-in arpeggiator, making this a really fun board for those of you who like pattern-based synth patches. Second, the XioSynth has a new “hybrid mode” that lets it act as a controller and synth simultaneously. I had wished the X-Station would do something like that, so that you can play one patch while triggering something else on your computer. Definitely a no-brainer. The only thing missing is the details on the synth; I’m talking to Novation today and hope to have those details for you. I’m betting at the very least a lot of the presets are monophonic, but we’ll see if they threw any polyphony in there. 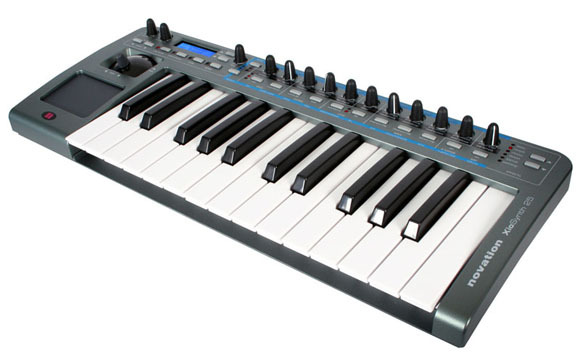 The price is coming in fairly low, too, for the added synth features: Ãƒâ€šÃ‚Â£229 (25 keys), Ãƒâ€šÃ‚Â£299 (49 keys). Smart move, Novation, too, getting this in before the onslaught of the NAMM show next week.